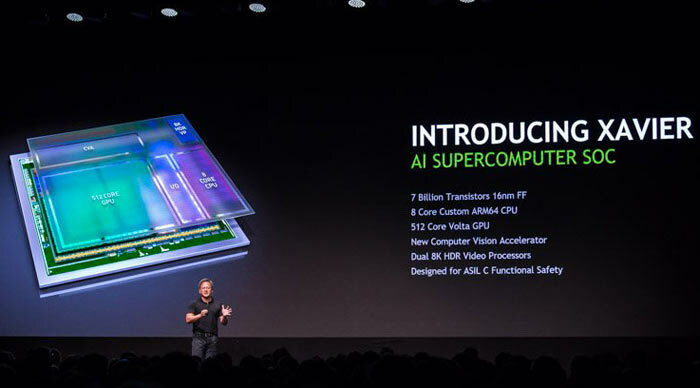 Yesterday at the GPU Technology Conference Europe Nvidia took the wraps off a new SoC design that includes Volta GPU technology. The new 16-nm FinFET processor, dubbed Xavier, is described by Nvidia as an AI supercomputer SoC, and designed for use in self-driving cars. Despite his long history of chip design Nvidia CEO Jen-Hsun Huang said that Xavier "is the greatest SoC endeavour I have ever known". The main components of this SoC are; a custom octa-core ARM CPU, a GPU with 512 next-generation Volta stream processors, a new computer vision accelerator, and dual 8K HDR video processors. 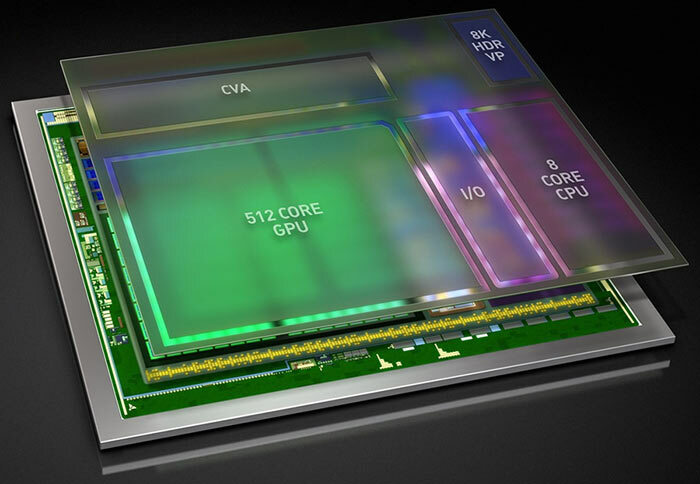 The SoC packs in 7 billion transistors in total and can "deliver 20 TOPS (trillion operations per second) of performance, while consuming only 20 watts of power," says Nvidia. Thanks to the jump in performance delivered by the Xavier SoC, Nvidia will be able to make new DRIVE PX 2 systems with a single Xavier SoC in place of the current dual Parker SoC and dual discrete Pascal GPU configuration – while consuming a fraction of the power. As car component safety is critical, Xavier is designed to be compliant to various automotive standards such as the ISO 26262 functional safety specification. Hopefully the scope and depth of these safety standards is adequate as Xavier is expected to be the brain in many a self-driving vehicle – an average 1,500Kg lump of metal and glass going as fast as 70mph on UK roads. Nvidia says it will start to ship the first Xavier SoCs in Q4 – including samples to the auto industry, research centres, and other organisations. Let's start small, Jen-Hsun. While you're dreaming big dreams, why not give us a Parker-based Shield Android TV v2.0? Wonder how that chip compares to the PS4 in raw specs, probably better in terms of CPU power. Please wait - downloading updates. The CPU part is ARM based, so I seriously doubt that. Especially since they are using a term like “TOPS” which means they are trying to make it harder to compare even the theoretical raw performance. This whole thing sounds like the usual marketing bullpoop we know from big hardware companies. You can make insanely efficient processors, but they then end up being unable to do complex computations in few cycles.